The Indian tradition of criticism is over two millennia old. 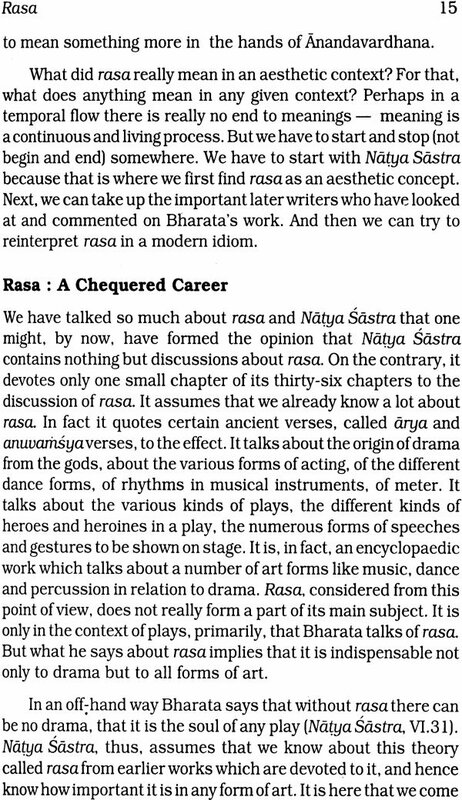 And its rasa theory has, from the beginning, essentially influenced authors, connoisseurs and art critics alike. 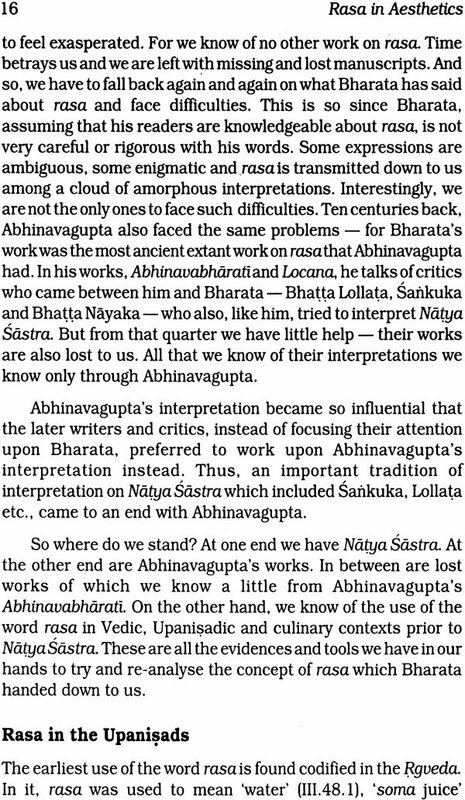 First expounded sometime between the 1st century BC and the 4th century AD in the eminent aesthetician, Bharata's Natyasastra, rasa theory deals with the 'emotive content' of a work of art - how it is depicted, inferred and transmitted. 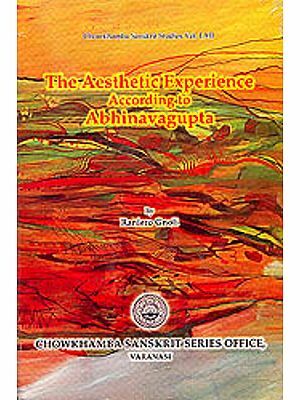 Dr. Patnaik's book is a unique effort that demonstrates, with diverse examples, the universality of this ancient theory and its applicability to modern Western classics. 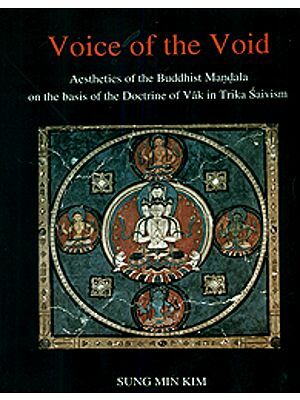 Elucidating afresh the concept of rasa and all its nine primary kinds largely on the basis of Natyasastra of Bharata and the commentaries of the 10th-century aesthetician, Abhinavagupta, the book investigates the validity of rasa theory as an aesthetic, more specifically, a literary theory, and how its canons are applicable to modern Western literature as well as Chinese love lyrics and Japanese haiku poems. Dr. Patnaik's trans-cultural exploration, thus, covers all major genres of literature - poetry, drama and fiction; and also major writers - Lawrence, Mayakovsky, Kafka, Camus, Conrad, Hemingway, Faulkner, Marquez, Eliot, Hesse, O'Neill, Ionesco, Beckett, Lorca, Neruda and several others, in emphasizing the universal validity of the rasa theory, the author consider certain modern problems relevant to text, meaning and readers'/audiences' response as well. Very few are the examples of applied rasa theory even in Sanskrit and other Indian literatures, leave alone its application to Western creative writing. This book, with its bold framework and lucid style, should, therefore, fascinate the scholars of Indology, Indian aesthetics and, above all, comparative literary criticism. Priyadarshi Patnaik (born 1969) is a serious research scholar combining in him the creative sensibilities of a poet, a painter and a musician. In many ways, he is well-suited to interpret Western literature vis-à-vis ancient Indian theories - especially as he takes a keen interest in Sanskrit and Pali literature. Dr. Patnaik has had a brilliant academic career crowned with a Doctorate in English from the Utkal University, Orissa. His passion for literature as a whole has since kept him involved in various literary pursuits. Dr. Patnaik has already published, to his credit, two collections of poems, besides a number of research papers in national and international journals. 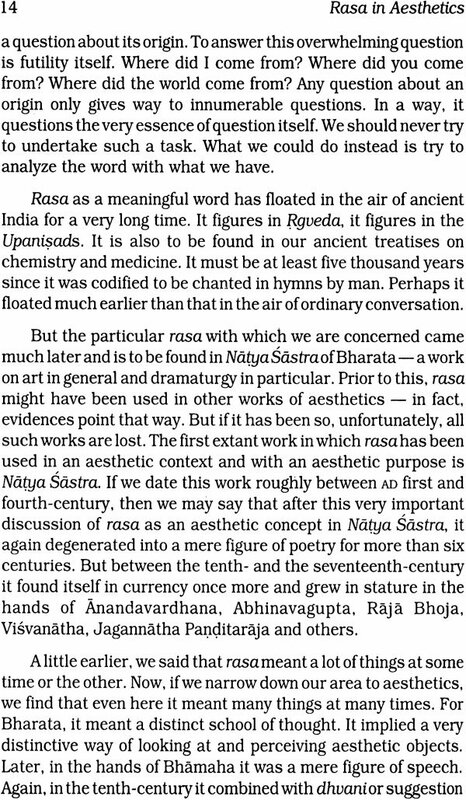 I am glad to write this Foreword to Dr. Priyadarshi Patnaik's brilliant study entitled Rosa in Aesthetics: An Application of Rosa Theory to Modem Western Literature. Apparently, it is addressed to literary critics of modern literature, a group to whose membership I cannot lay any claims. My studies have been in the area of Sanskrit poetics and since Dr. Patnaik bases his whole work on the rasa theory as perfected by the ancient masters, I might view it only as a modest scholar. 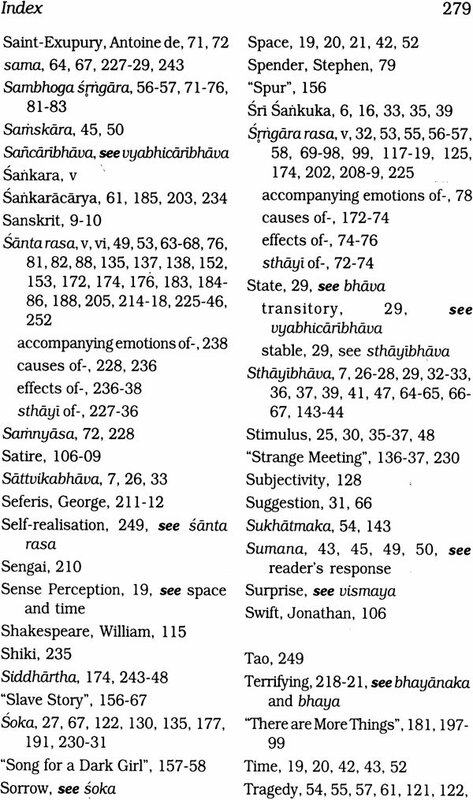 The actual examples of applied rasa theory, even in Sanskrit and other Indian languages, are very few. 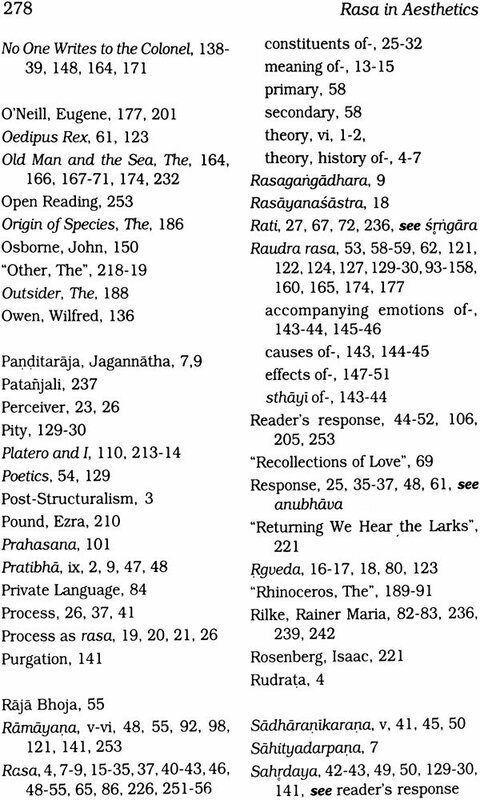 To the extent the rasa theory is universal in its application - with the concept of sadharanikarana - it must be adequate to analyse any worthwhile literature of any century. But when applying that theory we are faced with problems, not subjected to detailed studies so far, of intermixtures (sankara) and of appearances (abhasas), and of part-whole relationship (angangibhava). For example, while we have raudra and vira in the Gadayuddha episode of the Mahabharata, we have a shade of karuna-bhayanakain Draupadi's Vastrapaharana episode and karuna in Abhimanyu's death episode. 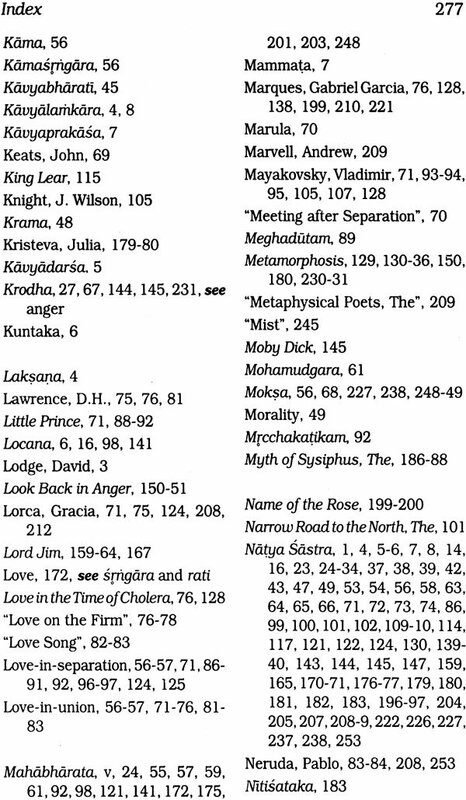 All these are overlaid by adbhuta as the episodes have epic stature. But, none of them is taken as the pradhana-rasa or the Master Passion of the entire epic by Indian theorists like Anandavardhana and Kuntaka. They make out a case for the acceptance of santa as a rasa on the basis of this epic itself. But what exactly is the positive sthayibhava of santa is an open question. Similarly, in the Ramayana we have srngara's abhasa in the Surpanakha episode and Ravana's overtures to sita. They are only psuedo-rasas and not real rasas though enjoyable as instances of the comic. Regarding sankara (blending) of rasas, the theorists are very rigid in disallowing any delineation of inimical rasas consecutively. Srngara and bibhatsa. hasya and karuna are tell-tale examples. These are some of the basic problems that arise while attempting application of old rules to new instances. The complexity of the problems is enhanced by the subjectivity of the critic also. I must admire the perseverance and probity of Dr. Patnaik in subjecting modem classics to a rasaanalysis - an exercise, first of its kind, as my knowledge goes. Franz Kafka, Mayakovsky, Ernest Hemingway, Conrad, Lorca, T.S. 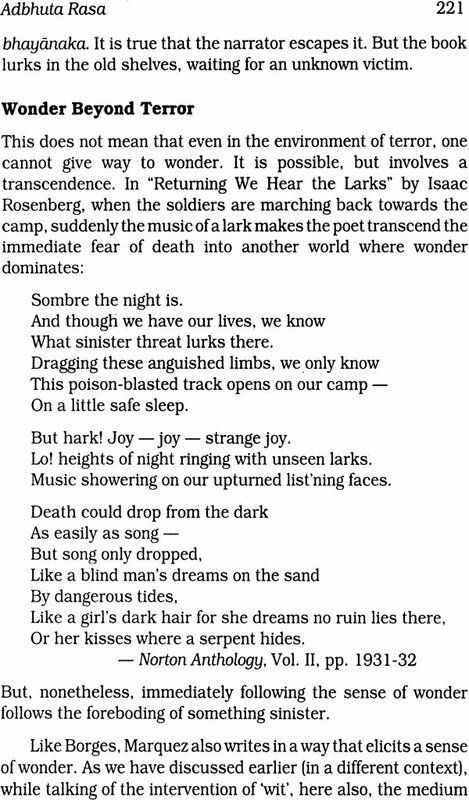 Eliot, Neruda, Albert Camus are only some of the writers whose work is subjected to an in-depth analysis, besides a number of works broadly coming under the 'Absurd'. 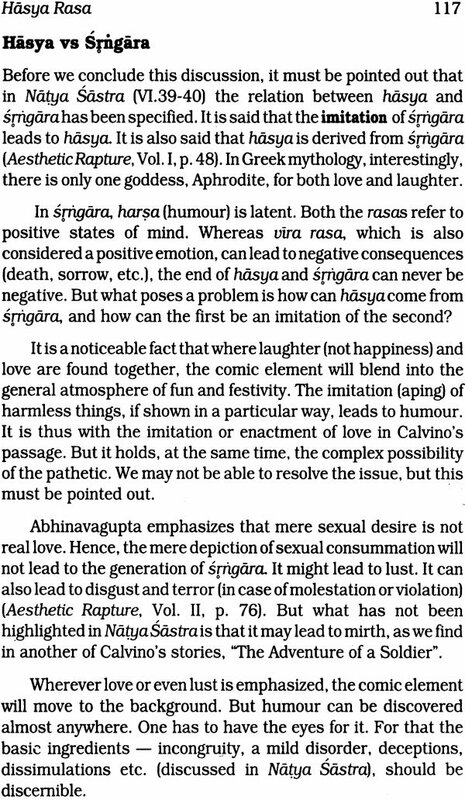 But the question remains if rasas identified in parts can explain the over-all rasa pervading the entire work satisfactorily, not to mention the nebulous yardstick of rasaucitya. bhava-sandhi, bhava-santi etc. While the recapitulation of the rasa theory in the first two chapters is quite scholarly and dependable, the bulk of the work devoted to a vivid account of navarasas with their paraphernalia, is a major breakthrough. It is bold in conception, strewn with Insights and brilliant in execution. The dimension of santa is explored in depth to accommodate the modem literature of alienation with its inability to locate Man in the metaphysical sense. Several questions are raised and possibilities are discussed with profound insight. In particular the areas of karuna. 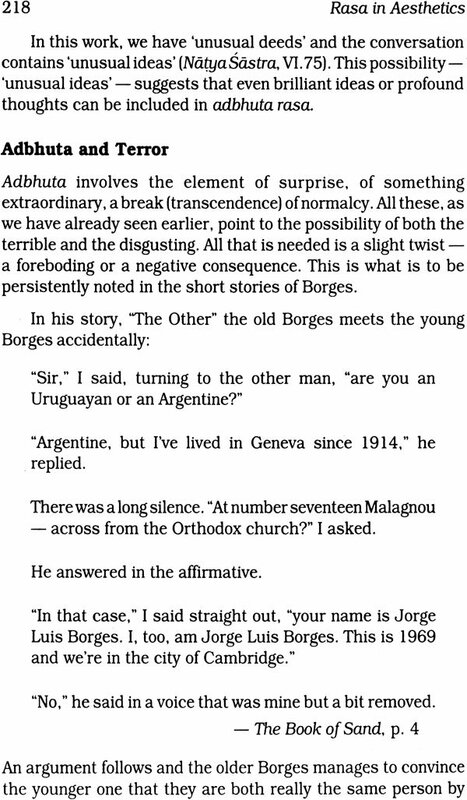 bibhatsa and bhayanaka have been enlarged and shown in a wider perspective as providing the key to a literature concerning Man's identity crisis. The metaphysical is also covered in the analysis of the worldly rasas. This study would be of great help not only to academicians and literary critics, but to the general readers also, as it gives extensive excerpts which can be critically assessed as well as enjoyed from the rasa perspective. 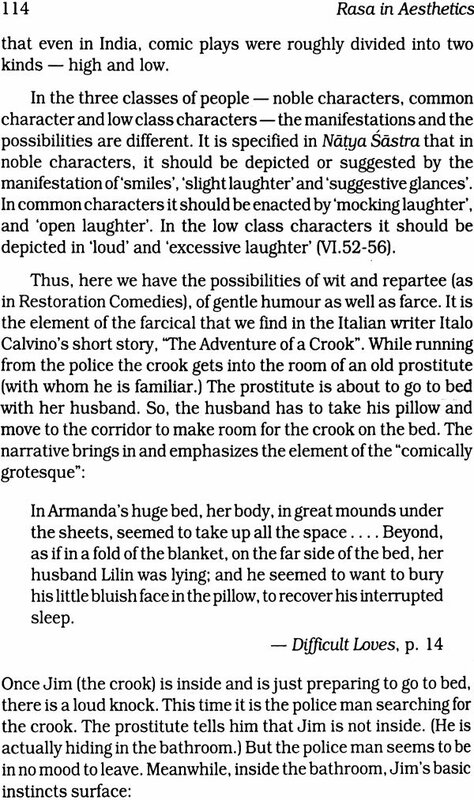 In a sky where criticism is becoming a meaningless jargon of specialists, this work opens up a new horizon for understanding modem literary pieces of great writers. I wish the work will reach the hands of enlightened readers and that it will stimulate further attempts at a deeper understanding of literature. When I first began reading Indian Poetics, the various types of literary figures (alari1karasl, the do's and don'ts of good literature, the various styles followed in different parts of the country confused me. For a person with linguistic inclinations, these were immense wealth. 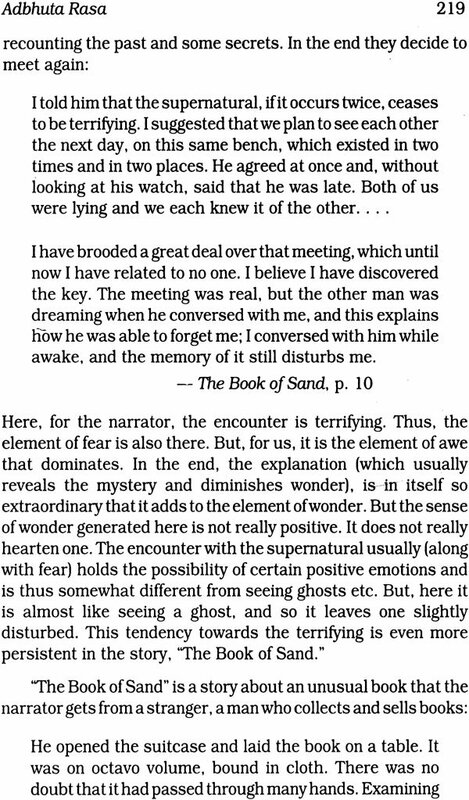 But for a man like me who read a book because he enjoyed it, what was immediately understandable and comprehensible was the theory of rasa which essentially dealt with the various kinds of emotions, how they are depicted, inferred and transmitted though a work of art. It made more sense because emotion was common to all the literatures I had ever read. I was further convinced because it did not leave anyone out. 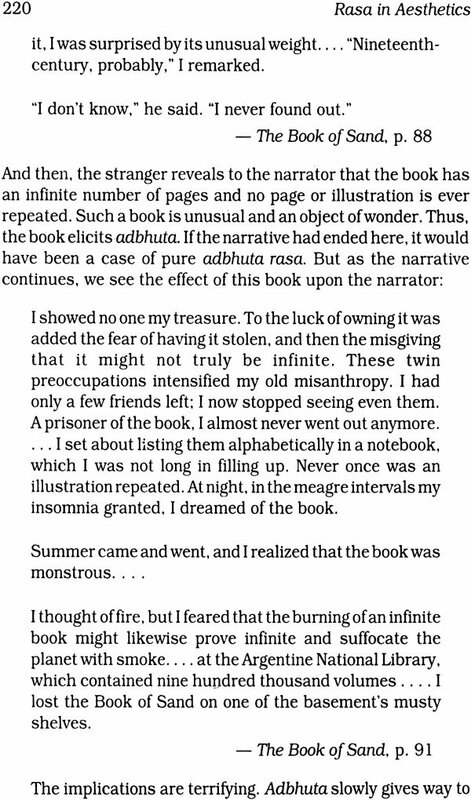 It took into account the writer and his genius (pratibha, the reader and his response (asvada) and obviously the work itself, which was there to be savoured. More probing showed that the rasa theory had tremendous linguistic potentials as well, which I could make out even with my limited knowledge of linguistics. For an emotion cannot ever be shown or communicated directly. It can only be suggested (dhvani) through words or their equivalents. 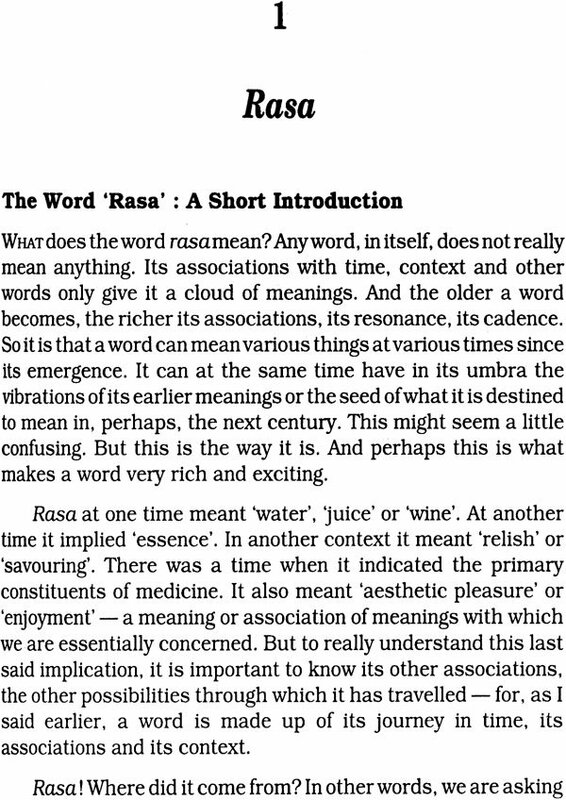 Further, in an academic world where theories were getting more and more technical, where dry intricate dialectic was hounding modern critics as it had once hounded some of our ancient grammarians and logicians, the rasa theory was refreshingly understandable. Not only that, it looked to me that it had, for these very reasons, a very strong need to be revived in a modern context. The present work is an affirmation of such a stand. What I have tried to do here is elucidate the rasa theory as lucidly as I could and then apply it to various modem Western works. I do not deny that some work has been done in this light before me. But I think this work is the first book-length application of the ancient canons of rasa to a wide range of modem European texts. The idea of the work was suggested to me by my guru Dr. P.G. Rama Rao. It was also he who was always there at times of difficulty with valuable suggestions as the work progressed. Without his presence this book would never have been written. Professor K. Krishnamoorthy, whose works on Sanskrit aesthetics I had always read and admired, was kind enough to go through my manuscript and agreed to write a 'Foreword' without having ever known or met me. I have no words to express my heartfelt gratitude to him. Professor C.D. Narasimhaiah and Dr. D.P. Pattanayak both motivated my interest in Indian aesthetics. I am grateful to both these esteemed scholars for the active interest they have shown in my work. Finally, I would like to thank my publisher M/s D.K. Printworld without whom this book would not be before you. Is the Rasa Theory Relevant? 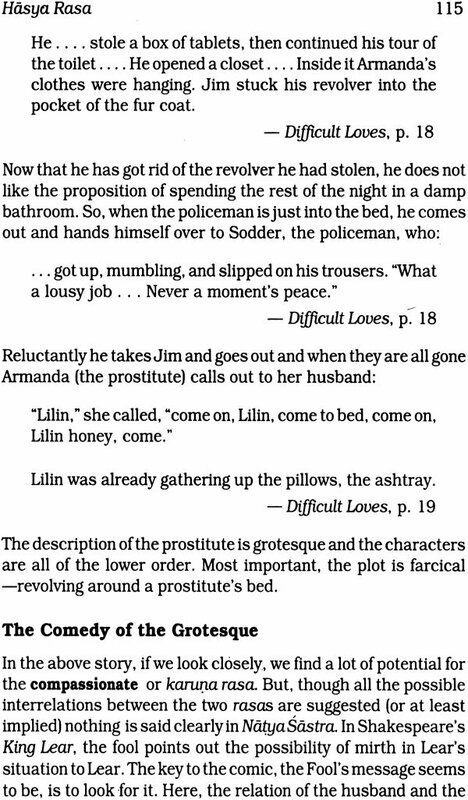 A valid literary theory is always one that has practical applications. The reason is clear. A literary theory is about literature. Unless it can be applied it has very little practical relevance. Then it usually stagnates or dies. If it survives at all it does as a mere fossil. In most cases a good literary theory has a double potential. It can lead to further theories to newer philosophical speculations. At the same time it can also be applied to literary texts. But this is not enough. The theory must cover a wide enough area. In other words it must have a general applicability. Not merely that. It should also be made of something that is not a matter of vogue. When interests have shifted such a theory would be left nowhere. And finally it must be flexible enough to take the wear of time to be malleable to interpretations and newer needs. The rasatheory, one of the oldest theories in Indian tradition fulfils most of these conditions. First expounded in Bharata's Natya Sastra, it influences the entire discussion of dramaturgy there as the very essence of good writing. It is in fact considered the soul of literature. The theory of rasa essentially deals with the various kinds of emotions and how they are depicted inferred and transmitted through a work of art. It holds that finally literature is essentially about life (simulated or imagined) and its emotions. And the problem that confronts a critic is to find out how in a work emotion is depicted suggested and how it is finally communicated to the reader or audience. The strength of this theory lies in that it deals with what is common to all mankind at all times—emotion. Secondly, it is a theory which is considerate of the entire literary process from its very conception in the mind of the artist to its final perception in the heart of the perceiver or reader. No one is left out. The artist is of prime importance. It is his genius (pratibha) only that leads to an excellent text which has the capacity to transport the essence of aesthetic enjoyment - rasa. The text is of great importance, for here it is that we see how emotions are suggested through words or actions. 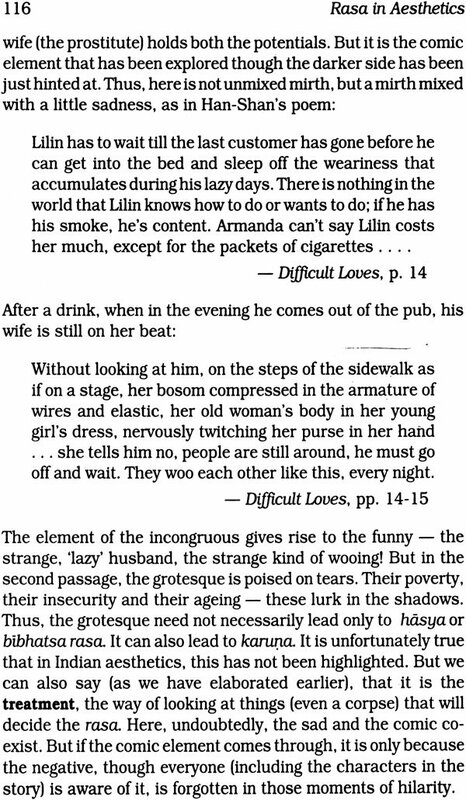 Finally, without the reader who perceives, savours (asvada) and enjoys, the text is useless. In the rasa theory, each of these factors is acknowledged for its indispensability. It is this total world-view that makes up this lucid theory. Thirdly, the rasa theory has a tremendous linguistic potential, for an emotion cannot ever be shown or communicated directly. It can only be suggested (dhvani) through words or their equivalents. Fourthly, it is one of our oldest and most influential theories "- that has grown over the centuries. Subjected to a rich tradition of dialectics and interpretation over a period of more than a thousand years, it has become richer and more complete. And not a couple of centuries back it influenced our regional writers and critics powerfully. Finally, it seems, now it is time our own rich canons are revived. It was probably with the advent of English education that our writers and critics came under the very strong influence of European writings and canons. Unfortunately, until recently, there was hardly anything to show that we had such a powerful critical tradition. Since the last few decades things are changing. We have a fairly large number of theoretical works on the rasa theory. And these days some good work in the field of practical criticism is also being done. It is essential in the present context to restore our rich tradition. And the best way of doing so is to apply it to an alien culture and prove that it works. The need to reinstate the rasa theory has a different kind of implication as well. In European criticism, New Criticism, a movement which got its momentum from the works of I.A. Richards and later grew in America in the hands of William Empson, Cleanth Brooks and others, was perhaps the last of the critical schools which could be easily understood by any perceptive reader. In a traditional sense, it aided the reading of literature by focusing on the various meanings and implications a work could generate. But in the sixties started a movement called Structuralism which focused on the linguistic implications of the text. Post-Structuralism, that followed, could be accused of nihilism since it denied a writer his authorship (Michael Faucault and Ronald Barthes), and, where a work was concerned, questioned its ability to mean (Jacquies Derrida). Such works had strong philosophical implications, no doubt. But as a well-known contemporary novelist and critic, David Lodge, points out in his book, After Bakhtin, what followed was a kind of technical and jargon-oriented criticism which was understood by only those who had had some training in that area of scholarship. In other words, practical criticism and critical writings on literature became so dense and difficult that only the academics read them. This is the present scene. 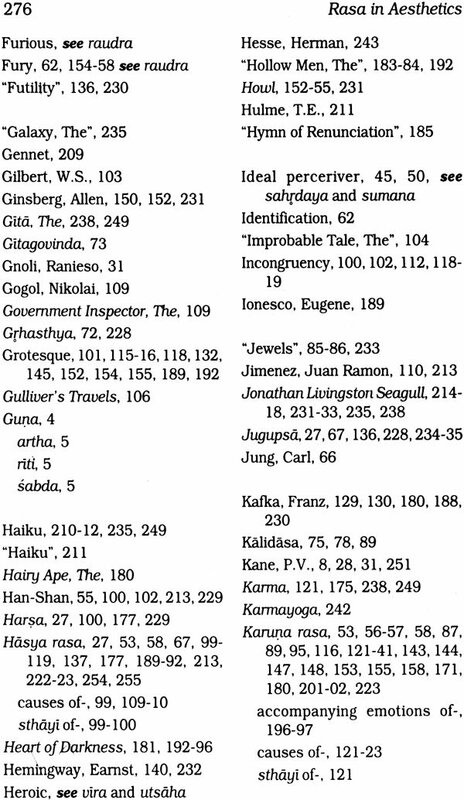 Unfortunately, most modern critical writings read like writings in Physics or Mathematics. There are innumerable words, technical terms, and what make things worse is that very few of them can be found in a dictionary. This trend has certain alarming implications as far as readership is concerned. Bluntly put, no one reads the modern critics except themselves and those who are working on them.